Long before Thayer County existed, the area was crossed by the Oregon Trail and the Pony Express. Between 1843 and 1869, thousands went west to Oregon’s Willamette Valley in search of farmland, while others split off to California in search of gold. (Ruts of the Oregon Trail still exist near Alexandria.) From Independence, Missouri to the Columbia River in Oregon, it took four to six months in covered wagons. When Nebraska joined the Union in 1867, Jefferson and Jones counties were united as Jefferson County. Three years later, what was originally called Jones County became Jefferson County and retained the old county records. The initial Jefferson County became known as Thayer County in honor of Gen. John Milton Thayer, a U.S. Senator and later Nebraska governor. As the St. Joseph and Western railroads built through northern Thayer County and the Burlington and Missouri River railroads crossed the southern part of the county, new growth resulted. Hebron was named the county seat. 1. Alexandria State Lakes: Alexandria is a small recreation area encompassing 55 acres of land with two lakes totaling 46 acres of water. The area is fairly level with mature trees offering fishing, picnic shelters and campsites with hookups and dump station. 2. California Trail Marker: Located at the museum site in Belvidere. One of the earliest trails in the county, it ran north of the Big Sandy Creek. 3. Fort Butler: Created to combat Native American uprisings in the late 1800s. At this time there is no indication as to where the Fort stood except the soil is a different color from the surrounding area. The Fort Butler marker is located on S. 1st St. in Hebron, several yards east of the fort site. 4. Fort Kiowa: Served as a stopping place on the Oregon Trail, and it protected early settlers from Native American raids. Some building foundations may still be seen. Approximately 9 miles south and 2 miles east of Deshler. 5. Little Blue Wildlife Management Area: 3 miles east of Hwy. 136 and Hwy. 81. Game and Parks Commission maintains hunting and fishing. Formerly the Poor Farm, there is still a cemetery on the property. Meridian Widlife Management Area is headquarters for managing of public hunting and fishing areas in the district. Formerly Walker Hog Farm southwest of Alexandria. 6. Marks Mill: Established by the Rev. Ives Marks, who also started the town of Rose Creek City. A marker shows the site of early pioneer businesses at the edge of the county on Hwy. 8. 7. 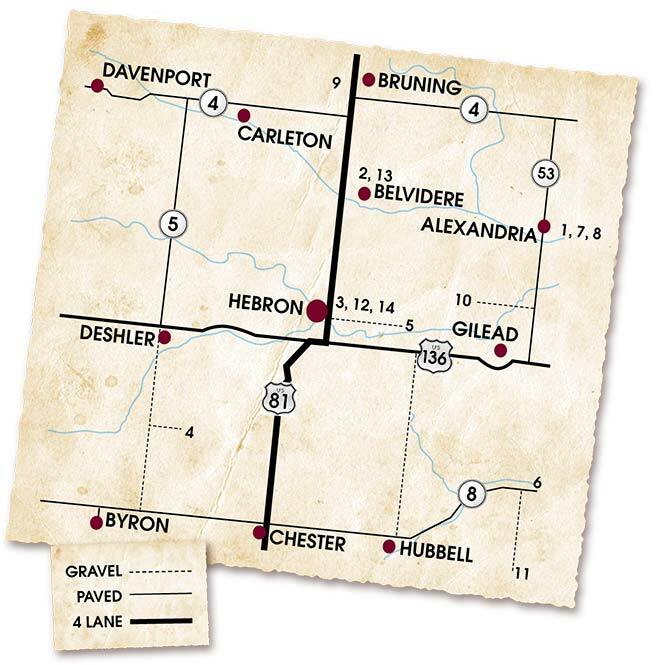 Oregon Trail: Crosses the county from Alexandria to Hebron, to Friedensau, to Kiowa, to enter Nuckolls County on the west, east of Oak. The largest marker on the Oregon Trail is located north of Hebron on Hwy. 81. The monument is made out of Red Granite and was dedicated May 24, 1915. 8. Pony Express Trail: Followed much of the same area as the Oregon Trail. Used to carry mail by horseback from St. Joseph, Missouri to California and back. Reenactments are held annually in June. 9. Prairie Marsh Wildlife Management Area: Sanctuary for waterfowl located two miles west of Bruning. 10. Rock School: District 17 school was built in 1873 and was open until 1955. This early school house is 2 miles north of Hwy. 136 on Hwy. 53., then 1 mile west on gravel Road N.
11. Surveyor’s Marker: The 6th Principal Meridian was the basis for all land measurements for all of Nebraska and Kansas and parts of Colorado, Wyoming and South Dakota. 12. Thayer County Courthouse: The Thayer County Courthouse was completed in 1903 of Indiana limestone in the Romanesque and Gothic style. This fire-proof building has floor-to-ceiling safes located in each major office with a different artistic work painted on each safe door. There are four carved faces found on the outside of the building and there is a story of the mystery related to the carvings. 13. Thayer County Museum: This five-building complex with artifacts from pioneer times to the present, houses exhibits from the 11 communities located in the county. A 135’ x 66’ “Red Barn” holds antique farm machinery and farming tools. Remains of an iron Leffel’s Double Turbine Water Wheel which measures 17 feet in diameter (one of the largest ever in the state) is also on the site. The museum annex is air conditioned and heated and is all on one level. 14. World’s Largest Porch Swing: One of the World’s Largest Covered Porch Swings has a seat 32 feet long and was constructed from a section of a center pivot frame (from Reinke Manufacturing in Deshler) which forms the top girder. The swing is said to be long enough for 24 children or 18 adults. It was originally built in 1985 and moved to its present site in 1991. 15. Spring Creek Model Trains: To Spring Creek Model Trains. Whether you are one of our “show” regulars or a first time visitor, we gladly invite you to come on in and browse around. We are the largest model train store between Denver and Chicago. Stop in and say “WOW’. District 10 School House Museum: Rural school building, known as the “school on the Oregon Trail”. Pony Express and Oregon Trail Monuments on the grounds. Open summers on Sunday_afternoons or by appointment. Alexandria Community Club oversees the site. One mile west and one mile south of the Alexandria State Lakes. Arrowhead Gardens Arboretum: Arrowhead Gardens Arboretum was established in the 1920’s. The gardens have been maintained through the years by volunteers. Eleven different varieties of trees, six different varieties of native grasses and many types of plants may be found in the gardens. Jefferson Avenue between 7th. and 8th. Streets. Belvidere Train Watching Station: This open-air constructed train watching station was completed in 2012 with private donations and grants from the Union Pacific Rail Road and others. Rail road buffs will be able to view Union Pacific trains on a double wide track system (the second line was completed in 1999) about every 20-25 minutes. Belvidere was selected as a “Train Town USA” community in 2013. Includes Thayer County’s last depot and a wooden boxcar. A nearby memorial flower garden can be viewed during the growing season. Bruning Opera House: The old Bruning Opera House built in 1907 is still in use for civic events and a collection of many photographs of the “good old days” are available for viewing at the Bruning State Bank located down the street from the opera house. Centennial Park Arboretum: This arboretum contains more than 15 Memorial Trees, 32 varieties of shrubs and a number of native grasses. Chester – Barn Quilt Village of Thayer County: Don Wassom of Chester had created over 60 barn quilts located throughout the village of Chester including the “Double Pinwheel” pattern at the junction of Nebraska Highway 8 and Thayer Street. Wassom will change his display of patterns from time to time. Pattern “Ohio Star” can also be seen in Chester. At 2247 Road 5000 near Davenport can be found “Americana Star Block. The “9 Patch.” Pattern is located at 408 East 6th Street in Davenport. The pattern “Churn Dash” is on display at 4948 US Highway 136 west of Deshler. Others can be found at 132 North Jefferson Street in Bruning and on Nelson Street in Hebron located west of Dollar General. And of course near the Cooperative Extension Office on the first floor of the Thayer County Courthouse in Hebron is the barn quilt pattern “4 H”. District 17 Rock School: This one-room school was also named the Coordsen School in later years. Built in 1873 with native limestone rock obtained from the surrounding hills. Rural Gilead. From U.S. Highway 136 go north on Nebraska Highway 53 two miles, then take county road N ½ mile west. The Friendship Garden: A garden including a Dragon Sculpture, flowers, trees, plus a replica gazebo of the old wooden agricultural hall that once stood on the grounds of the Thayer County Fair. Fort Butler Marker: The red rock marker with a bronze plaque was erected in 1930 by the Oregon Trail Chapter of the Daughters of the American Revolution to honor the establishment of a stockade in 1869 called Ft. Butler. It was named in honor of the first Nebraska governor, David Butler. The stockade was built on the bank of Spring Creek west of the present-day marker by Company A, First Nebraska Cavalry which consisted of about 65 men for protection of the settlers. Hebron Post Office Mural: Painted by Miss Eldora Lorenzini in 1939. The work was part of the New Deal’s WPA Federal Art Project which employed thousands of artists during the Great Depression. The 12 ft. x 4 ft. mural, which depicts the scene of a corn train that left Hebron on the Rock Island Railroad on March 31, 1887, was one of 12 murals painted in Nebraska. The painting has a double signature of the artist, because the first was covered by the molding of the frame. Lorenzini then signed it with large letters in the lower left hand corner where it may be seen by the viewer. She was paid $670 for her efforts. Little Blue River in Thayer County: The river stretches across the southern edge of Hebron and offers fishing, canoeing, hiking and hunting. Look for eagles that fly over the downtown businesses in the summer. The Little Blue Wildlife Management Area is two miles east of Hebron on River Road and is another great place for hunting, fishing and sightseeing. Bands of wild turkeys can also be seen on River Road. The one-mile plus Rock Island Walking and Biking Trail also follows the river in the south part of Hebron. Little Boy Blue Monument: The monument was erected in memory of a boy’s body, dressed only in blue pajamas and found on a cold snowy night in 1985. The community named the boy “Matthew,” (Gift of God) and gave him his final resting place in the southeast corner of the Chester Cemetery which is located on the east side of US Highway 81 just north of Chester. His grave is usually marked with a number of toys and other small gifts on his tombstone. The boy was later identified as Danny Stutzman who had been abandoned by his father. Reinke Manufacturing Company, Inc.: Founded in 1954, Reinke Manufacturing Company, Inc. is one of the world’s oldest and largest manufacturers of center pivot and lateral move irrigation systems. Reinke also provides state of the art precision system monitoring and control using GPS and satellite based communications devices and a wide range of control panels and pipe materials for use in the agricultural and processed water industries. Reinke products are distributed by a group of highly qualified dealers positioned throughout the United States, Canada and in more than 60 countries worldwide who assist ag producers in conserving water and increasing food production. Call ahead for tours. Sixth Principal Meridian Marker: This location marks the point where all land in Nebraska, Kansas and most land in Colorado and Wyoming and parts of South Dakota were surveyed and subdivided. Two markers are located on the site, one State of Nebraska Marker and a stone monument placed there by the American Association of Surveyors. The spot was first surveyed by Col. Charles A. Manners in 1856 as a result of the Kansas-Nebraska Act of 1854. All legal land descriptions—all sections, all ownership and use documents, and all city, farm, and lot boundaries within the sixth principal meridian—-come from this. Nine miles east of Hubbell on Highway 8 and three miles south on Road 7300. Sky Hawk Field: A field where remote control airplanes can fly. Christmas in Chester Light and Sound Show: The former Chester School building comes alive each December with tens of thousands of Christmas lights choreographed to a wide range of Christmas tunes. Park in front of the school on Hebron street and tune your car radio to 90.7 then sit back and enjoy the hour long show. December 1 to January 1, 6pm to 10pm nightly. Treasures Unlimited: This year-round flea market also includes a few antiques and many one-of-the-kind “treasures” at very reasonable prices.